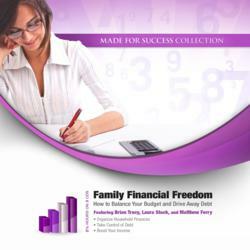 In the daily whirl of work, family obligations, social interactions, and all the other activities that make up our busy lives, it’s easy to lose track of the basics, like household finances. Who wants to worry about the bills with so many other things to fret about? But effective handling of your household budget forms a foundation for your efforts elsewhere, and it’s especially crucial for busy parents. In this presentation, Laura Stack, the Productivity Pro®, teaches you the fundamentals of staying on top of your home finances, from budgeting to insurance needs. Put these tips into play and you’ll soon establish the firm footing required to move confidently toward your goals for your family and your life. With that foundation laid, you’ll be ready for Brian Tracy’s tips on how to set and achieve million-dollar goals. Now is the greatest time in history to become a self-made millionaire, and Brian Tracy can show you how to do it. Not only is it possible to build financial freedom and a healthy bank account, it’s easier than you think. This program is filled with the best ideas and strategies for creating and maintaining wealth. Every self-made millionaire was poor at one time, and each of them had to learn the basic skills taught here. Once you’ve mastered these income-boosting techniques, you’ll be one step closer to realizing your dreams. So take control of your financial future today. No matter what your situation is, you will absolutely benefit from this program. You’ll learn how to conquer debt, build wealth, and retire happy. Laura Stack is a personal productivity expert, bestselling author of four books, and a professional speaker whose mission is to build high-performance productivity cultures in organizations by creating maximum results in minimum time. She is the president of the Productivity Pro, Inc., a time-management training firm specializing in productivity improvement in high-stress organizations, and the 2011–2012 president of the National Speakers Association. Since 1992 Laura has presented keynotes and seminars on improving output, lowering stress, and saving time in today’s workplaces. Laura has been featured on CBS’s Early Show, CNN, and the New York Times; her clients include Walmart, Starbucks, Cisco Systems, and Bank of America.